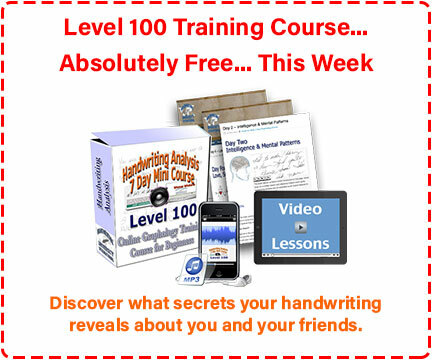 Level 100 (Index ) 7 Day Handwriting Analysis Course - Members Only – Handwriting University: Learn Handwriting Analysis and Graphology. 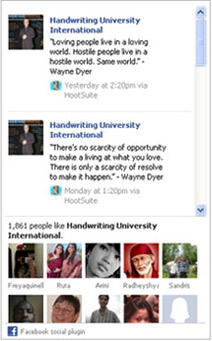 This is Handwriting University International’s online training course for beginning level students of graphology. This simple 7-part course gives you a broad introduction to the science, a few specific strokes and personality traits, plus a few bonus videos and audio training lessons. Be sure to view the “Bonus Speed Learning” Video to learn the basic traits even faster. IF YOU ARE NOT A BASIC MEMBER, PLEASE REGISTER TO ACCESS THE CONTENT BELOW. (100% Free This month). Register now. will find in the introductory Handwriting Analysis Level 100 course. Finished with your Level 100 Course? 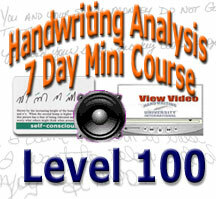 Upgrade here using this link and get started with the next level of scientific handwriting analysis. 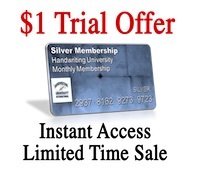 Upgrade to Level 101 now for as low as $77. then use the above link to upgrade from this page and save.